This report covers the four chlorinated methanes: methyl chloride (CH3Cl), methylene chloride (CH2Cl2; dichloromethane), chloroform (CHCl3), and carbon tetrachloride (CCl4). Chlorinated methanes are chiefly used as precursors—methyl chloride for silicones and other materials, methylene chloride for its solvent properties, chloroform for hydrochlorofluorocarbon-22 (HCFC-22) for the production of PTFE, and carbon tetrachloride, which since the phaseout of CFC-11 and CFC-12, is consumed for the production of HFC-245fa and HFC-365mfc. As CFCs are being phased out, use of carbon tetrachloride for the alternatives—HFCs such as HFC-245fa and HFC-365mfc, and possibly HFO- 1234yf/ze—is growing. Consumption of chlorinated methanes has been and will continue to be influenced by which fluorocarbons are produced and whether they are consumed as a refrigerant or used as a precursor in the production of other chemicals. In general, fluorocarbon consumption is dependent on its ozone-depletion potential (ODP) and globalwarming potential (GWP). 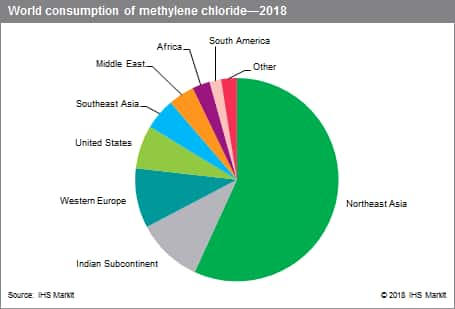 The following pie charts show world consumption of these four chlorinated methanes. The refrigeration industry has been going through many changes, and will continue to do so. Hydrofluoroolefins (HFOs) are expected to have considerable growth during the next five years, particularly HFO-1234yf and HFO-1234ze. HFO- 1234yf has been introduced and is being widely accepted as a low-GWP replacement for HFC-134a in mobile air-conditioning units, and HFO-1234ze has been introduced as a blowing agent for polyurethane (PU) foams and as a propellant for aerosol applications, potentially displacing both HFCs and other nonfluorinated propellants as a low-GWP alternative. 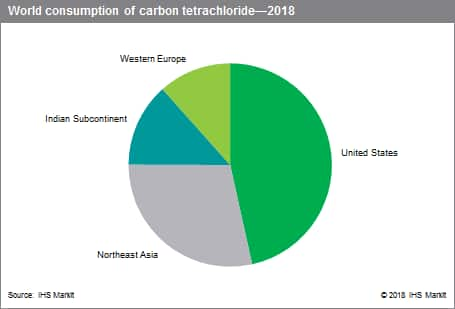 Northeast Asia, led by China, is the largest consuming region for chloromethanes, accounting for nearly half of total consumption in 2018, followed by Western Europe and the United States. 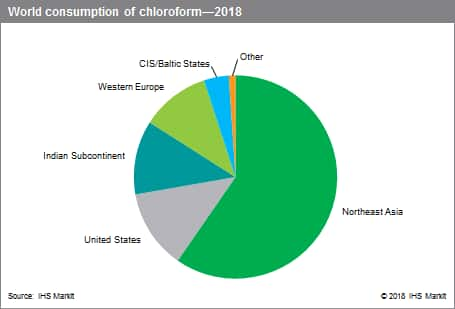 Overall consumption of chloromethanes will continue to increase during 2018–23. 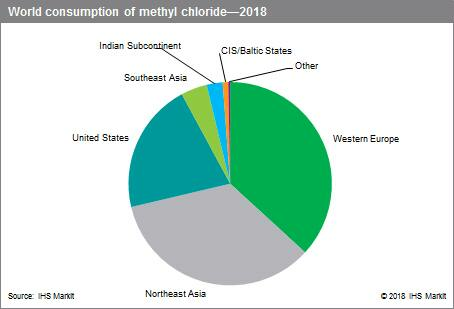 In 2018, consumption of methyl chloride to produce methyl chlorosilanes accounted for the vast majority of its total consumption. Production of methyl cellulose was second, followed by production of quaternary ammonium compounds. A potential growth application is use of methyl chloride (and/or chloroform) in the production of HFO-1234yf as a replacement for HFC-134a in mobile air-conditioning systems. Use as a solvent is the leading application for methylene chloride, particularly in closed industrial systems such as the production of pharmaceuticals, fine chemicals, polymers, and as an extraction solvent. Adhesives, metal cleaning, use as a paint remover, and HFC-32 production are the next-largest applications, followed by foam blowing and aerosol uses. The leading application for chloroform is the production of HCFC-22, accounting for nearly all consumption. HCFC-22 is used both as a refrigerant and for production of the fluoropolymers PTFE, FEP, PFA/MFA, and ETFE. Although legislation has impacted the use of HCFC-22 as a refrigerant, the resulting declines have been balanced by increasing use in the production of fluoropolymers and, to a lesser extent, fluoroelastomers.